The Tyrolean community of Kappl constructed a new village centre. It is designed by the architectural firm Kritzinger Brenner. Since the property is located on a developed ridge, existing houses had to be demolished and then the complete ridge had to be secured for the duration of the construction. The size of the excavation and the steepness of the ridge made this quite an extraordinary shoring job. 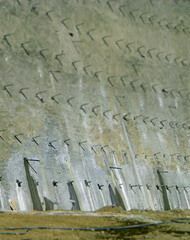 Engineer Bernhard Wietek designed a soil nailed shotcrete wall, 20 m (66 ft.) high and 100 m (328 ft.) long, to secure the excavation. It was built by the Hilty & Jehle Company. Drill Drain Anchors were utilized for the first time to drain the ground water in the slope. They were installed in an upwards angle (in contrast to the angle of the soil nails) to gravity drain the water at depth in the hillside. A specially designed water permeable grout was used for the installation, which allowed for the gravity draining. These drainage anchors collected and drained the water deep behind the wall, which prevented moisture saturation of the soil directly behind its shotcrete face. Consequently, the geological properties of the soil, as in friction angle or cohesion, are not influenced by water. This improves the stability and safety of the shoring wall. In future projects, with similar conditions, this system should also be applied. The ground water distribution is quite irregular due to the unevenly layered strata (Fig. 1). The wall thickness was 15, 20 and 25 cm (5.9”, 7.9” and 9.8”) respectively. The shotcrete was reinforced with two layers of mesh in order to resist the bending moments induced by the soil nails. To carry the soil pressure, 12 layers of Hollow Bar™ soil nails between 5 m (16 ft) and 12 m (39 ft) were installed. To learn more about the unique applications of the Drill-Drain, contact us today.